I’ve got yet another squash recipe for all of you! It is winter squash season, after all. This time it’s spicy sausage and squash soup. It’s a comforting combo of creamy, zesty and (naturally) sweet. This recipe features one of the forgotten squashes, but also my favorite — buttercup. This is the type of squash that I ate most often growing up, and I love it now as much (or more) as I loved it then. My mom always made it as a mash and it often accompanied our holiday dinners, along with other meals in the fall. I don’t know why, but this squash isn’t as abundant in stores as some of the others and sometimes, can be hard to find. On the outside, it is dark green and looks very similar to a kabocha squash, but the texture on the inside is creamy, moist and smooth, unlike kabocha’s waxy and dry texture (that is actually the one squash I don’t care for). It has a natural sweetness, like most squashes, and is a delicious accompaniment to any meal or fantastic all on its own. Preheat the oven to 350 degrees. Cut squash in half and scoop out seeds. Place flesh side down on a baking sheet or other oven proof pan. Add about 1/2 inch of water to the pan. Roast in the oven for 45-60 minutes or until squash is tender. Set aside to cool. In a large pot over medium heat, melt the coconut oil. Then, add the onion and garlic, and stir. After a few minutes, add the pork sausage and break up with a spatula. Continue to cook for several minutes, until sausage is browned and cooked through. Next, scoop the buttercup squash flesh into the pot. Add the broth and stir. Then, add the coconut milk, water, apple cider vinegar, bay leaf, sea salt and pepper. Bring soup to a simmer over medium-low heat and let cook for 20-30 minutes. Remove bay leaf and serve. You know me, I LOVE winter squash too! This looks so yummy, as usual for your recipes. I have some buttercup squash waiting for me in my cupboard…now I have the perfect recipe for it! Thanks. I’m so happy to hear that you give buttercup squash some love too. It’s such a delicious one! I hope you enjoy the recipe! Oh man this sounds so good! And it looks good too 🙂 I’ve never had that type of squash before, can’t remember if I saw it back in Michigan! Doubt I could get it here since so far all I’ve seen is butternut squash… but you say that works too so YAAYY! Btw don’t know why but it made me laugh when I read your ‘yields 4 servings’ because you should see the amount of food Joe eats! I mean he eats for 4 people lol! Thanks, and yes, butternut squash is a great substitute. The serving size is a complete estimate and is probably more like 3 or 3.5 servings, depending on the size of your bowl. With a pound of meat, we generally get anywhere from 2-4 servings, but since this is in a soup, I estimated on the higher end. The squash and coconut milk make it more filling too. Hope you enjoy it, Teresa! I made this today for lunch and loved it! 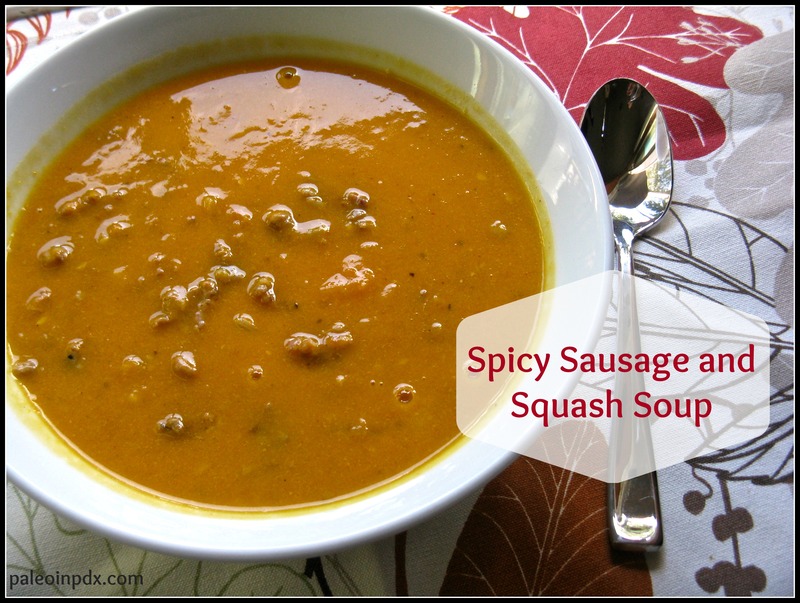 The sweetness of the squash is perfect with spicy sausage. I used butternut but I should be able to get my hands on a buttercup soon and will definitely make this again! Funny you mention the dryness of kabocha–I had read so many raves about it so when I finally found one, I was a little disappointed for that very reason. I tried buttercup for the first time last year and liked it much better than the kabocha. I’m so glad you liked it, Paula! We just finished off the leftovers of ours yesterday and I’m already thinking of making it again soon. I totally hear ya on the kabocha…bleh. The time I bought it was actually an accident too, as I thought it was a buttercup. Now, I always double-check the sticker! I just made this for lunch and it was amazing! I substituted the Kabocha for a Butternut. Thanks! This soup is fantastic! Thank you!